Poet and author Palma Mingozzi has new show on cable access television, channel 34 Staten Island. Poet Palma Mingozzi speaks with the stars on new cable show. Boulevard Books author Palma Mingozzi will interview major musicians on her new talk show on local cable access Staten Island, channel 34. Luminaries such as composer, trumpeter, film maker Volker Goetze; Bass clarinetist Oran Etkin; Drummer Mario Layne Fabrizio, and Cole Davis Upright Bassist will all be on hand to discuss their art and life. 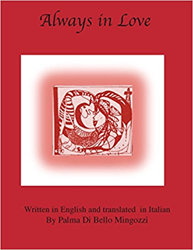 Palma Mingozzi is the author of the recent volume of poetry, ALWAYS IN LOVE, a collection about love for lovers. With expansive sensuality, she brings us poetry about LOVE like you've never experienced--it's relations and every day meaning for our lives. This volume of larger than life Dual language English-Italian love poems will refresh the heart and enervate the soul of every person.